There is just something almost magical about pedal cars that is impossible to explain. Maybe it's the memories they invoke of our more youthful days. Maybe it's the yearning for simpler times. 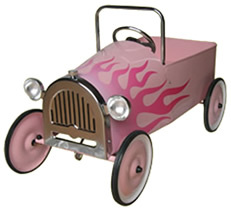 Whatever it is, that time is available once again with this range of pedal cars. 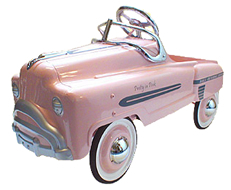 Presenting the beautiful 1950's Murray Comet Pedal Car in Pink. One of our best sellers, particularly because of it`s quality build, specification and most attractive price. 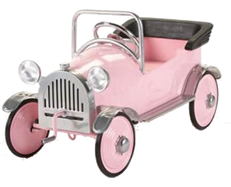 Features include: chrome windshield, chrome grill ornaments, chrome headlights, chrome steering wheel, chrome portholes and hubcaps.The chrome finish is metal as opposed to plastic. Sealed bearing pedal mechanism with 5 position pedal adjustments to suit most children 2 to 6 yrs of age. Also comes with black padded seat. Sealed bearing pedal mechanism with 5 position pedal adjustments to suit most children 2 to 5/6 yrs of age. Also comes with black padded seat. All metal construction with solid Duralast rubber tyres. Delivered fully assembled to your door. 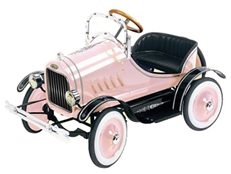 Finished in Pink/White, the car has a chrome windshield,chrome steering wheel, chrome hubcaps, leatherette padded seat, sealed bearing mechanism, solid duralast tyres for longer life and all steel construction. Very well finished throughout with excellent turning circle.Will run very well on grass, as the tyres are a little wider than on some of the other cars. Overall length: 39.5 in. Overall width: 16.75 in. Overall height: 13 in. to the top edge of body. 20 in. to the top ...of steering wheel. Wheel diameter: 9 in. Wheelbase: 23 in. Shipping weight: 35 lbs. This train promises to be a great favourite with young and old. We can see these not only in your garden but at playgroups, children’s nurseries and children’s activity park’s, in fact anywhere there are children these are a must. The seats and backs are padded for that extra comfort. There are decorative dials in front of the steering wheel and an imitation chimney to give that added attraction. 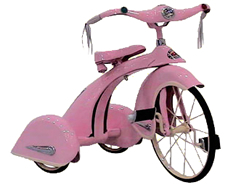 The adjustable pedals and larger than average body allows a wide range of children. The bodywork is powder coated and designed to last. The wheels are made of steel, the tyres are rubber. 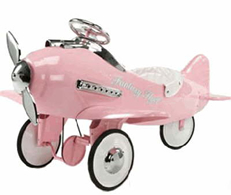 Now here's something completely different for little girls! Brand new to our range First introduced in 1930. Hugely popular this year, after featuring in several Celebrity magazines. 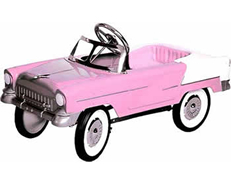 Georgeous in every single detail, and finished in lead free Pink powder coat paint for a durable and glossy finish. Suits Child 3-7 Yrs Old. The Sky Princess trike has a leather look sprung saddle, wheel mudguards, working headlight, leather handlebar tassles finished in white, adjustable seat height, and metal spoked wheels running on sealed bearings, just like the ones avaliable in the 50's and 60's. 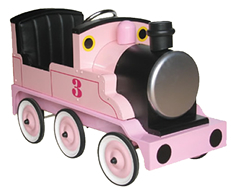 Georgeous in every single detail, and finished in lead free Pink powder coat paint for a durable and glossy finish. Solid Duralast tyres ensuring longer life.